Thanks to transplant42 (aka Bamber Bunny laurie31 and MrBamberrific) and nnaylime, here are the BSG guest panels at DragonCon on Friday, Saturday and Sunday. thoughts on the show, their characters, and the cliffhanger they left us with until January. Guests: Tahmoh Penikett, Kevin Grazier, Richard Hatch, Michael Hogan, Edward James Olmos, Aaron Douglas, Colin Corrigan, James Callis. Guests: Tahmoh Penikett, Michael Hogan, Edward James Olmos, Kevin Grazier, James Callis, Aaron Douglas. they are doing and what secrets they’ll let slip. Guests: Richard Hatch, Michael Hogan, James Callis, Aaron Douglas, Colin Corrigan. The BSG guests are: James Callis, Jamie Bamber (cancelled), Richard Hatch, Aaron Douglas, Tahmoh Penikett, Katee Sackhoff (cancelled), Edward James Olmos and Michael Hogan. The final book of our saga in which our rag-tag fleet has reached earth, or has it? Listen to our guests’ thoughts on the show, their characters, and the cliffhanger they left us with until January. The final four were truly who they said, civil war has sprung up, Lee Adama is president, and only Deanna knows the final cylon. Left with a big mid-season cliffhanger, there are lots of questions are out there. Come and ask! Make contact with some of your favorites from Battlestar Galactica. Find out what new things they are doing and what secrets they’ll let slip. Monday September 1st @ 11:30 am – Earth at last? As we head into the final hours of the con, let’s see what more answers we can find out from our guests about the final 11 hours of Battlestar. Below is a map of where Aaron will be sitting in the Walk Of Fame. Join the Twelve Colonies and the Colonial Fleet in a celebration of our heroes! Dance with Libran, share wine with a Leonis, and cheer on our brave protectors! UPDATE (August 21, 2008): The location of The Colonial Fleet party has changed from the Grand Ballroom to the Capitol Ballroom. 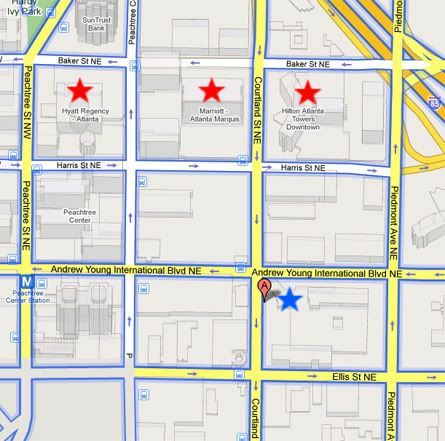 Below is a map of the 3 host hotels (red stars) and the location of The Colonial Fleet party (blue star). UPDATE: Below is a list of the BSG Guest Panels and a map of where Aaron will be sitting in the WALK OF FAME.